Congratulations to Lindsey Creel, Mallory Curlee, and Adrienne Yunger! 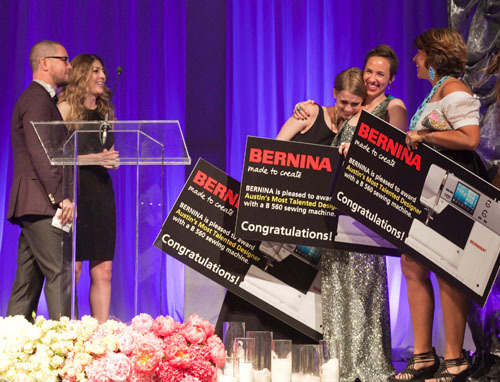 BERNINA of America presented each of these emerging fashion designers from Texas with a BERNINA 560 sewing machine during Austin Fashion Week 2014. M.E. Shirley is a small batch womenswear line based in Austin. Designer and owner, Lindsey Creel creates and constructs each piece with the intention of making “someone’s favorite piece” every time. M.E. Shirley is an ode to Mary Edna Shirley, Lindsey’s great- grandmother, and is based on the idea that we can accomplish anything we dream. Creel worked for a number of companies in New York, including Rachel Comey, before moving to Austin two years ago. Mallory Curlee lived in Central America and returned to the United States with a passion for beautifully fitting swimwear. An avid swimmer and surfer, Curlee coupled her passions with the dream of becoming a fashion designer and formed CurleeBikini. She started her EcoLUX Swimwear line in November 2009, a few years after she graduated from Fashion Institute of Design and Merchandising in Los Angeles. CurleeBikini Swimwear is an Environmentally and Ethically Conscious, Luxury Swimwear Line that aims to inspire women of all ages to love and embrace their natural form. Adrienne Yunger’s involvement in fashion began at an early age after witnessing her grandmother’s custom designs for dolls. She attended the University of Texas at Austin to study fashion design and retail merchandising, and then transferred to the University of the Incarnate Word in San Antonio, Texas, where she received her BA in Fashion Management and Design. Adrienne moved to New York and assisted in several fashion shows including a Vera Wang bridal show. She then moved back to Texas, where she worked as a bridal buyer assistant. She currently teaches fashion design and creates custom designs for clients. Handling beautiful designer gowns and working with brides expanded her appreciation for couture construction and details.